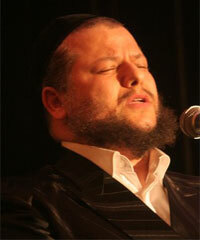 "A GREAT VOICE, A MODEST SOUL..."
Cantor Yitzchok Meir Helfgot was born in Tel Aviv, Israel. From the tender age of five, after hearing Moshe Koussevitzky’s recording of “Akavia Ben Mahalalel," Yitzchok Meir knew what his life's calling would be. At just eight years old, Cantor Helfgot recorded his first works, and then spent much of his childhood and teenage years studying voice and nussach (the art of prayer). Cantor Helfgot held his first concert at twenty-three years old, performing three great works—Zibert’s “Mimkomcha,” Kwartin’s “Tiher Rabbi Yishmael” and Rosenblatt’s “Ad Hena”—all of which were masterfully executed and admired by those in attendance. It was at this point that the world began to realize the divine gift in Cantor Helfgot, taking us back to the Golden Age of Rosenblatt, Koussevitzky, Kwartin, Sirota and Hershman. G-d) rouses all who hear his golden voice to new spiritual heights. Leading the way in today's revival of liturgical music, Cantor Helfgot has performed in concerts spanning six continents, where time after time he has left audiences spellbound. From New York to Beijing, from South Africa to Italy, and from Russia to Australia, Cantor Helfgot has drawn record crowds. Concertgoers agree it is almost impossible not to be warmed by the fire of his magnificent, soulful voice. Just when you think he has reached his peak, Helfgot takes you higher. Cantor Helfgot currently serves as Chief Cantor of the Park East Synagogue in New York City. He appears regularly for Shabbatot around the world, and is currently booked for Shabbatot and concerts through the spring of 2008. Cantor Helfgot’s recent recording, entitled “Barchi Nafshi – Bless Hashem O My Soul” and his latest album “Avot,” have broken Jewish record sales.